The online course Come Rain or Shine has been selected to receive the award for its outstanding outreach and sustainability. This education endeavour, launched in 2016, up to today has been taken by more than 23,000 members of the public, including students and teachers. Numerous comments online confirm the value of this project as a resource in the classroom. The course is accessible online and it is offered free of charge to everybody around the world. In this way, it can reach new and harder to reach audiences. Running a course on a FutureLearn platform – a leading Massive Open Online Course platform delivering online learning to participants around the world – supports interactive and engaging aspect of this project. The Royal Meteorological Society partnered with the University of Reading to develop this three week course which focusses on the processes and phenomena which govern UK weather. The content of the course was developed with the needs of UK secondary geography teachers in mind, however the course was open and very much of interest to all. Dr. Sylvia Knight (FRMetS) is Head of Education for the Royal Meteorological Society. Her responsibilities include supporting the teaching of weather and climate in UK schools. Dr Pete Inness is a lecturer at the Meteorology Department of the University of Reading. 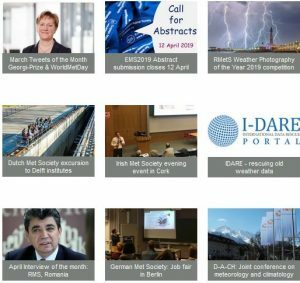 The Award will be presented during the Media Session of the EMS Annual Meeting 2018 on 5 September 2018, where details about the project will also be highlighted in a presentation by Liz Bentley, Chief Executive of the Royal Meteorological Society. The free online course, available via FutureLearn, was created with the aim of training geography teachers in basic weather and climate processes, in order to teach their pupils the national curriculum. Since it launched in 2016 it has been taken by more than 23,000 members of the public, including students and teachers who have left comments online stating how useful it has been as a resource in the classroom. Come Rain or Shine was created in partnership with the Royal Meteorological Society. It covers topics like weather charts, the physical processes that cause weather and how to use weather measuring equipment. 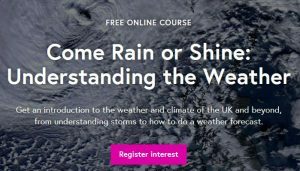 Course content includes videos, fieldwork activities and other practical exercises, written by Dr Peter Inness from the University’s Department of Meteorology, and Dr Sylvia Knight, Head of Education at the Royal Meteorological Society. This was supported with £10,000 sponsorship from Thames Water. The free course will run three times in 2018, with the latest run starting on 18 June. It requires around three hours of flexible study time per week over a three-week period, or longer if required. It is supported by Ph.D Meteorology students at the University, who provide online mentoring to participants. FutureLearn is a leading Massive Open Online Course (MOOC) platform delivering online learning to participants around the world, free of charge. Running a course on this platform has been a key way for the University to engage new and harder-to-reach audiences, and to develop course content that is interactive and engaging.